Friday's protest in public by the four senior-most Supreme judges is the first instance in which a group of judges are raising allegation against the Chief Justice of India. Shine Jacob lists other instances where judges 'went one against the other in public'. The outcry by four Supreme Court judges against the functioning of Chief Justice Dipak Misra, however unprecedented, is not the first instance in history where judicial persons have gone one against the other in public. The arrest of former Calcutta high court chief justice C S Karnan for contempt of court, for instance, had grabbed headlines in recent times as he became the first Indian judge to be sent to jail in India. Another case of a direct attack on the Chief Justice himself came way back in 2009 when Karnataka high court judge D V Shylendra Kumar fired a salvo at the then Chief Justice of India K G Balakrishnan for not making his assets public stating that 'he is more like a serpent without fangs, who can only hiss, but not bite'. However, Friday's protest in public by the four senior-most judges Jasti Chelameswar, Ranjan Gogoi, Bhimrao Lokur and Kurian Joseph is the first instance in which a group of Supreme Court judges are raising allegation against the Chief Justice of India. Currently, there are 25 sitting judges and seven out of the full strength of 31 are retiring this year. Justice Chelameswar is set to retire in June. Justices Lokur and Joseph will retire in December. Earlier, there were reports alleging Chief Justice Misra had intervened to ensure only judges of his choice heard a sensitive case about corruption involving a retired high court judge. But Justice Karnan's case was the most controversial so far. In January 2017, Justice Karnan wrote a letter to Prime Minister Narendra D Modi flagging the names of 20 judges alleging corruption. Even though he failed to provide any evidence, he urged the government to investigate the matter. After a series of allegations in public, including an unprecedented order by him sentencing India's chief justice, and seven other judges of the Supreme Court, to five years in prison, the top court even barred the media from publishing Justice Karnan's statements. Later, he was arrested in June 2017. Justice Chelameswar had a clash in November over the assignment of a sensitive case. Two petitions seeking a special investigation team to look into allegations contained in a first information report filed by the Central Bureau of Investigation were listed before two different benches. While one bench referred the petition before it to the Chief Justice to set up an 'appropriate' bench, the bench presided over by Justice Chelameswar directed the petition before it to be heard by a five-judge bench of senior judges. Within hours, Chief Justice Dipak Misra rose from the Constitution bench he was presiding over and set up a five-judge bench which annulled Justice Chelameswar's order. 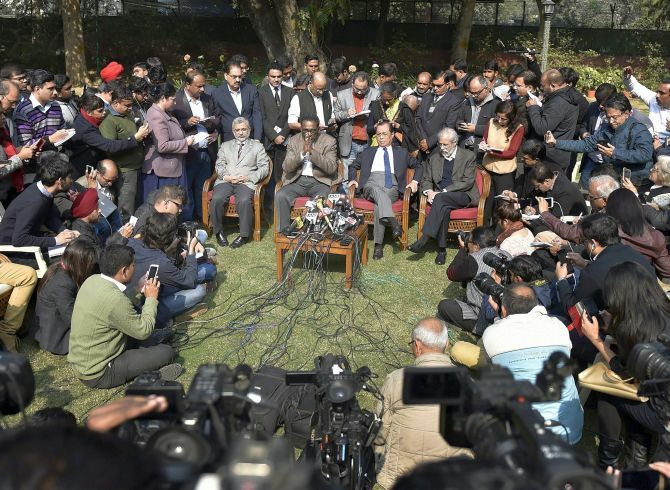 Chief Justice Misra asserted that it was the Chief Justice of India's prerogative to set up a Constitution bench and he could pick the judges to fill it. The order was passed in the Chief Justice's jam-packed court room amid shouting matches by the men in black. Old timers remember an instance in the 1980s in which one judge stormed out of court while hearing a case because his senior colleague was dominating the court and the junior was not given any say. While walking out, Justice E S Venkataramiah, who later became the Chief Justice, uttered unkind words about his senior, embarrassing the bar and making front page headlines. Later he called the media and explained that he was not against the senior, but only wanted brother judges to be heard. Controversies over comments by judges are not new. For instance, then chief justice R M Lodha had gone all out in 2013 against the government observing that the CBI is like a 'caged parrot speaking in its master's voice'. And then, Justice Markandey Katju had said 'hang the corrupt to the lamp posts' while hearing a bail plea connected to the fodder scam. Another recent comment by a judge that raised eyebrows was by Justice Mahesh Chandra Sharma of the Rajasthan high court, stating that the cow should be declared the national animal.